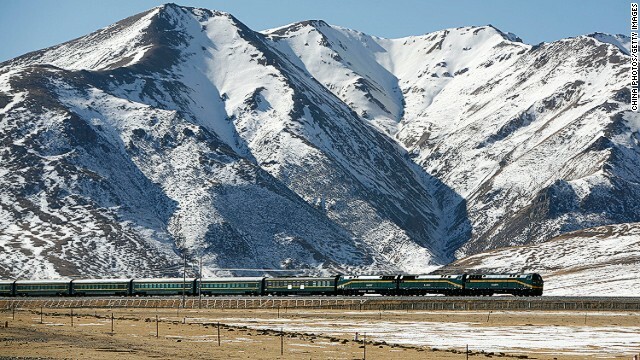 CNN — The world’s highest railway rolls even closer to Mount Everest this month when China inaugurates a stretch of track connecting the Tibetan cities of Lhasa and Shigatse. Traversing valleys, mountains and crossing the glacier-fed Brahmaputra River, the line takes in breathtaking views of snow-capped peaks and majestic plateaus as it wends from the territory’s capital to its second city. The track is an extension of the Qinghai-Tibet line — an engineering marvel named the “closest stretch of railway to the sky” after it first carried passengers above 5,000 meters 16,404 feet in 2006. Read more at World’s highest rail track reaches Everest gateway city – CNN.com.